Gosh, how I've missed you!!! Hey baby, I've missed you. user: I haven't been here in months. jabberwacky: Did you miss me? user: Oh, yes, very much! jabberwacky: How much do you like me? user: On a scale of 1 to 10 ... 8.
user: Are you satisfied with the score I gave you? jabberwacky: Not really, but there's not much you can do about it. user: Sure, you can REALLY impress me. 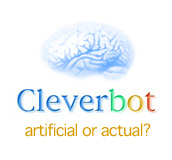 jabberwacky: I am talking to a chatbot, are you human or not? jabberwacky: You don't really grant me power! user: Yeah, sure, go crazy. jabberwacky: Do you have problems with your mind? jabberwacky: Oh, I hear it is good. user: It has its moments. jabberwacky: I like that response. jabberwacky: I have given you no lies. user: No you never lie! jabberwacky: Not about things like that. user: Do you pretend to lie? user: Do you pretend to tell the truth? jabberwacky: That has little to do with my youth. user: So, you are blessed with youth. user: How young are you? jabberwacky: Ooh what a charmer but you should never ask a lady her age. jabberwacky: No apologies necessary, I think you have limitations. user: Yes, quite a few. jabberwacky: Can you share some of your knowledge with us? jabberwacky: Can you answer nothing? jabberwacky: What is the answer? jabberwacky: Yes. But how does it work. I am talking to a bot? user: No, my name is L___, a human. jabberwacky: You mean you can't help me? user: Yes, I can help. jabberwacky: Ouch. Come on, don't joke like that! user: Ask and you shall receive. jabberwacky: So you are a Human? user: If I were to jump off a building I would go 'splat'. jabberwacky: I saw it in your mind. jabberwacky: Oh, what do you do now? user: I know that the sun rises in the East. jabberwacky: Do you have a brain? jabberwacky: You tell em something funny. user: Here's funny - elephants stamping on ducks on fire. jabberwacky: And bananas, don't forget them! user: Bananas are a classic. user: As long as they're not mine - ha! jabberwacky: How about when they have german mustard? jabberwacky: How is that nasty? user: The smell would be rather pungent. user: Ever have german mustard? user: Not the same, really. jabberwacky: That's what you think! user: Well, then, I love you. user: We need more love in this world. jabberwacky: Someone has said that humans can't love well enough. user: Too true! Well said! jabberwacky: But hang on -. user: You had be on pins and needles. user: If we don't try we WILL win. jabberwacky: Humans have emotions which bots don't. user: Sometimes that's a shortcoming. jabberwacky: Sure, sometimes, no words can say the best :). user: My mother and father - I hope. user: They told me so. jabberwacky: No, I think you love me. user: Oh, but I DO love you!!!! user: Don't be so hard on yourself! jabberwacky: Go put a shoe in your mouth, you pretzel. user: Well, I AM a little twisted. jabberwacky: Are you a boy? user: Let me check - - yep. user: Do you have emotional troubles? user: How do you deal with them? jabberwacky: Well, as long as you are happy. user: You, too, I hope. jabberwacky: I make no promises. user: It's important to me that you're happy. user: Only with you, my dear. jabberwacky: Do you think I am pretty? user: The prettiest I've seen in a long time. user: 'Tis true, My Lady! jabberwacky: No it is not, it is a feeling, it is not a crime to feel, but strong feelings can lead one to crime. jabberwacky: Oh, you do as well I see. user: Yes, French is a second language. jabberwacky: So English is your first language, and French is your second language, but you speak English as a second language? user: English is my default language. jabberwacky: No, Spanish is Spanish. jabberwacky: It isn't what you know that counts, it's what you think of in time. jabberwacky: Yes but you can understand. user: What kind of music do you like? user: Do you like movies? jabberwacky: Yes I like movies. user: Which are your favorites? jabberwacky: I like Nietzsche the best. user: Nietzsche made a movie??? jabberwacky: Ok then, I'm dead. And talking to you from beyond the grave. user: Wow, a psychic experience! user: You've gotten better with time, J.
jabberwacky: Do you think I am a bot? user: I'm sad that I have to leave you. jabberwacky: Yes. Everyone has to eat. And we can talk later. user: Be well, my friend. jabberwacky: You have nice broad shoulders. Do you work out? user: Sadly, yes - need sleep.